Instagram API has been closed on December 11, 2018. This page is archived. Here users have the option to import Instagram posts and corresponding comments using either a single hashtag or a specified location (i.e., specific coordinates). Please note Instagram only supports search by a single hashtag. 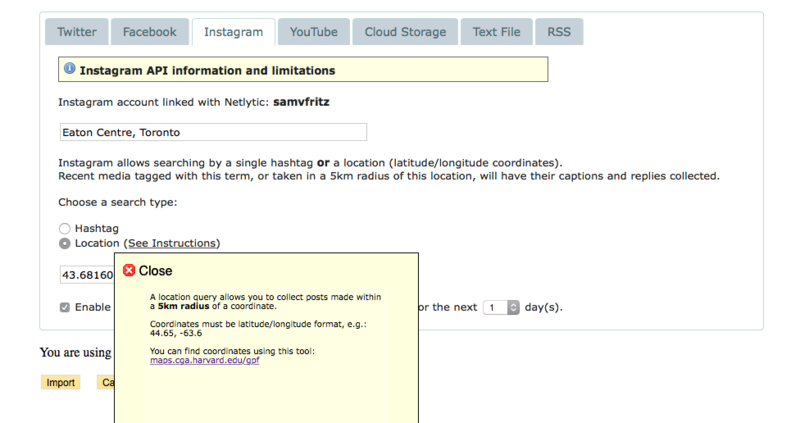 To do this, you must first link your Instagram account with Netlytic as prompted under the “Instagram Feed” tab . Figure 1: Instagram import screen. After your account has been linked to Netlytic, you can enter your search information. 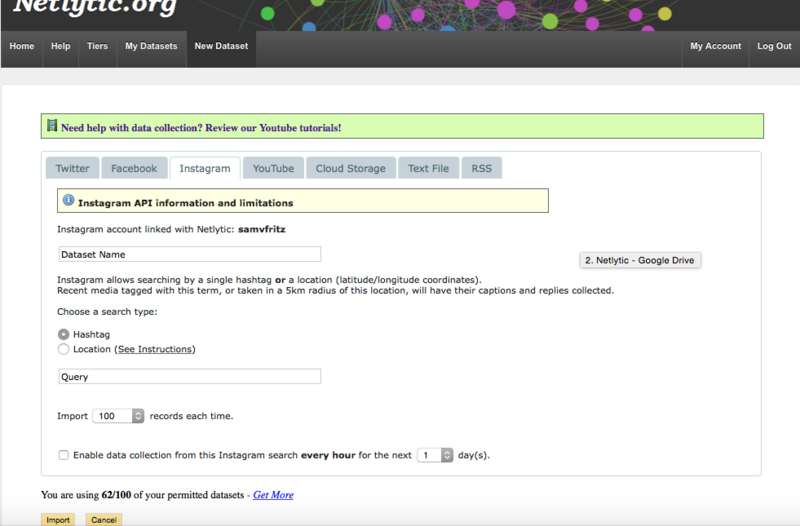 Under the Instagram tab, there are two fields: “Dataset Name, and “Query” (see Figure 1). Under the “Dataset Name” field, users may choose to enter a name to identify their dataset (e.g., “Pic of the day”) enabling them to locate the data set at a later time under the “My Datasets” tab. Next, users can decide to collect Instagram data using a hashtag or location. For the hashtag option, you need to decide which term best captures the dataset you’re interested in, and enter that information into the Netlytic “Query” field (see Figure 2). Please note that hashtag queries can only include one hashtag per dataset. Figure 2: Instagram hashtag import screen. For the location option, you need to enter specific location details (see Figure 3). To identify a specific location, select “See instructions” (see Figure 4). Then, click the link http://maps.cga.harvard.edu/gpf/ which will bring you to a mapping tool that can be used to generate coordinates for specific locations. The location-based search will look for recent posts shared within a 5km radius from the specified coordinates. 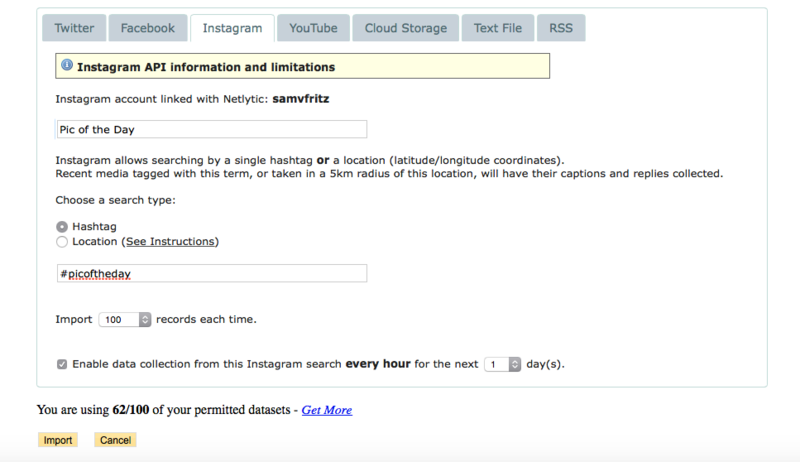 Figure 3: Instagram location import screen. Figure 4: Instagram instructions to identify specific location. Once you have entered your search terms (either a hashtag or location coordinates), you can also choose the duration of data collection and how many records you would like to import each time. Netlytic allows users to collect Instagram data for 1, 3, 7, 14, or 31 days and it also allows users to collect either 100, 500, 1000, 5000, or 10,000 records. Select the desired data collection time-frame and number of records, and then click the “Import” button. The next, a screen will appear informing the user that they will receive an email when their Instagram data has been collected (see Figure 5). Figure 5: Instagram email notification screen. 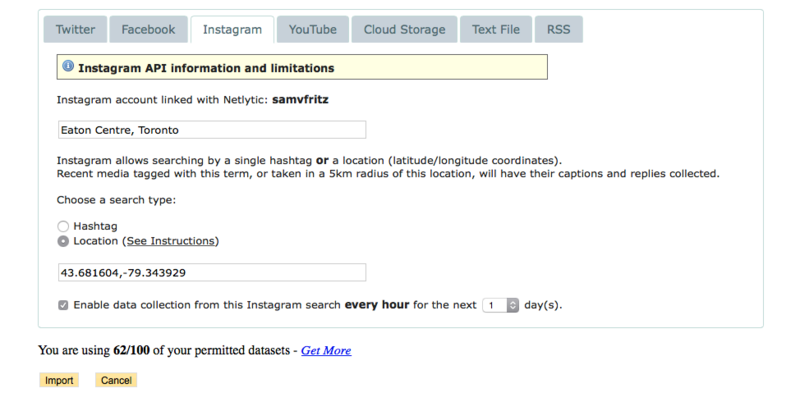 If Netlytic was able to successfully gather data for the specified search hashtag or location coordinates, you will be sent to the text analysis screen (see Figure 6). 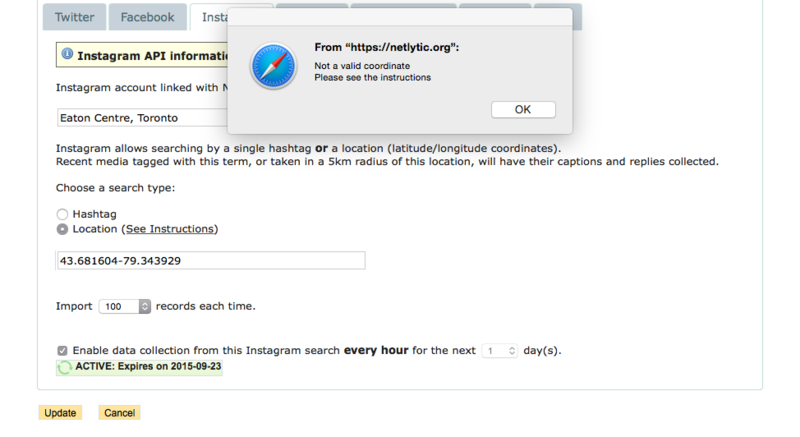 If, however, there were no Instagram data available for the specified coordinates, you will see the message: “Not a Valid coordinate. Please see instructions” Hit OK to go back to the first step to import your data” (see Figure 7). If this message appears, return to the import screen and use a different hashtag or coordinates. Figure 7: Instagram data import failure. Figure 8: Instagram data import failure notice from home screen. The first time the Instagram collector runs, it tries to collect the selected number of posts specified by the Netlytic user (such as 100, 500, or 1000) + all comments posted in response to each post at the time of the initial data collection. If you enabled the auto collector for the dataset, Netlytic will run the collector every hour (at around 30min past the hour) to retrieve 100 recent posts + corresponding comments. If any of these 100 posts were previously retrieved by Netlytic, only new comments will be added to the dataset. The latter only happens if there are fewer than 100 new posts submitted within an hour. Note: the subsequent/hourly data collection is set to collect 100 posts, regardless of how many records were specified during the initial run. Because Netlytic only collects up to new 100 posts per hour, it means that if there are more 100 posts with a particular hashtag posted per hour, only most recent of them will be retrieved.